Do you remember reading Jonathan Swift's Gulliver's Travels? 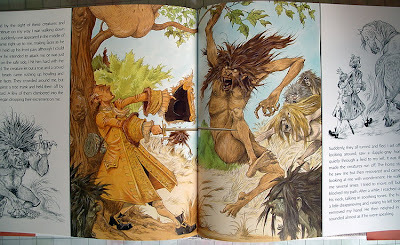 One of the greatest fantasy adventures, full of strange people and quirky places. I knew that we had to include this children's classic in our home library. But the problem arose ... which version should I buy for my twins? Yet, before I threw myself headlong in the quest for the most children-friendly version, I had to remind myself about the original Gulliver. We often forget that Swift's original text Gulliver's Travels is primarily a deeply political work penned as a comprehensive satire of the political reality of 18th century Britain and Europe. For the average reader, adults and children, it is difficult to fully appreciate the nuances, political criticism and the full depth and scope of the original story. But there is also no need to take it all in when reading Gulliver's Travels. 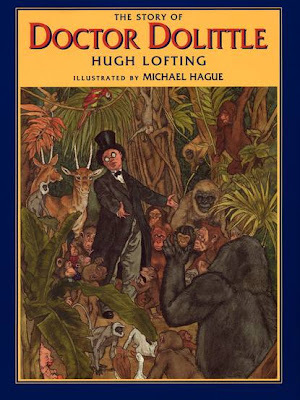 The unabridged text would undoubtedly be a daunting read aloud for today's kids. No wonder. Gulliver's Travels was published back in 1726 and was very much a product of its times. Yet, we all know about Gulliver's Travels and it is part of our collective heritage. I felt it would be a shame if I could not find a way to get my twins acquainted with Swift's masterpiece and its principal motifs. So, without further ado, I have good news for all Swift fans out there! I came across a truly fantastic adaption of Gulliver's Travels that simply begs to be read aloud! The book's name is .. Jonathan Swift's Gulliver . 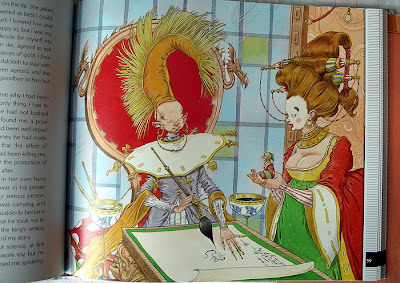 The number of illustrations in this smashing book is incredible! 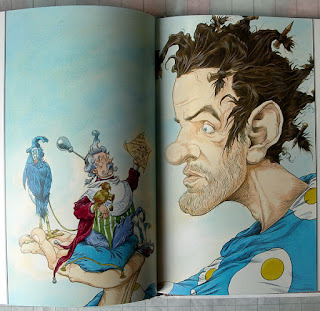 Most illustrations are in full color and they are the work of master illustrator Chris Riddel. The text is a fantastic adaptation of Swift's novel, which was very tastefully done by award-winning author Martin Jenkins. He succeeded in an extraordinary feat: to maintain the the tone and humor of the novel, while making it accessible to young readers. Admittedly, I always prefer the unabridged text to abridged versions. Yet in the case of Jonathan Swift's Gulliver I think the opposite may be true. 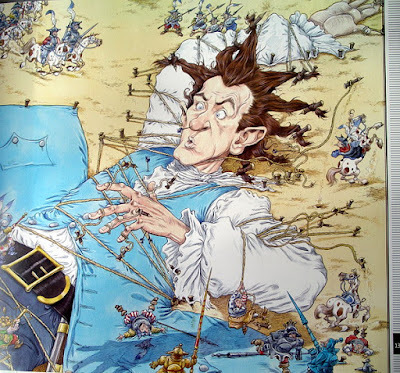 Namely, I expect my kids would have to wait a long time before they would be ready for the original Gulliver's Travels. So, I will leave it to my kids to read the original 300-year old text when they grow up. For now, I will introduce them to the story with the help of this perfectly illustrated masterpiece. The story has been retold faithfully (also with a rich vocabulary) by Martin Jenkins, author of many acclaimed children's books and winner of Oppenheim Awards and the NISTA/CBC Outstanding Trade Book for Children award. Afraid of missing out on this great edition, I ordered it and it is now in our children's library. It looks even more luxurious and imposing in my hands than I expected when I ordered it. 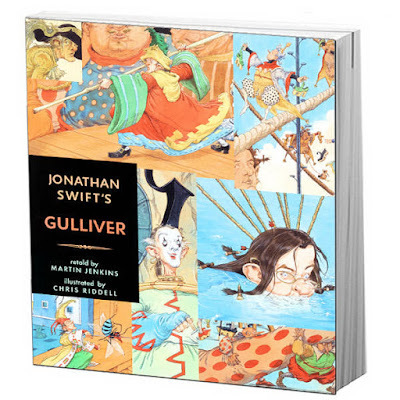 Jonathan Swift's Gulliver is a book that is certain to hold the attention of your kids easily, as the size of illustrations and the book is simply spot on for reading aloud. Swift's masterpiece is a complex tale of human strength, of human failure and a satirical view of government and political systems. Perfect read aloud and discussion material. You will be happy to know that the Jenkin's retelling of Swift's story contains all of Gulliver's adventures. Although Jenkins retells an abridged version of the adventures, the most entertaining elements of the story are all there for enjoyment. 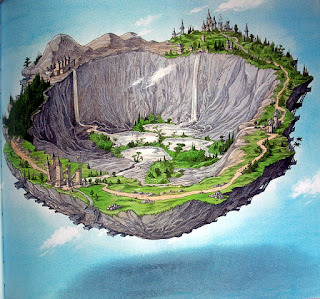 Readers and listeners will be able to enjoy Gulliver's adventures to the tiny men in Lilliput and Blefescu, to the giants of Brobdingnag, to the flying island of Laputa and the country of the Houyhnhnms. that nature ever suffered to crawl upon the surface of the earth." Kate Greenaway medalist Chris Riddel brings exquisite panoramic detail to Gulliver's adventures and an almost cinematic quality to the book. Riddell who works as a cartoonist for The Observer, has the perfect touch to bring the sensibilities of Swift's deeply complex work alive. His vibrant illustrations are so strong that it is difficult to imagine a child losing interest in this dynamically illustrated story. You will be blown away by the quality of this edition. For now it is standing in our library waiting for my twins to grow a little older! Make sure you don't miss this book in your library or your bookshop. Jonathan Swift's Gulliver is the perfect introduction to Swift. Would you believe it that your comment slipped through my "virtual net" and that I just read it today! As they say, better late than never! Wow great finds! I really enjoy your tips. Great advice!